Summary: Lifelong learning has been recognized by many internationally renowned organizations which claim that people should possess certain life skills or competences to live in a world full of complex uncertainties. In this study, we propose A phaslised, thematic and socialised (PTS) pedagogy as a teaching approach to address the issues concerning how to equip learners with better capabilities. The qualitative method was employed based on a case study where interviews with several stakeholders were conducted. Observation of PTS practice and analysis of school documents were also carried out. The findings revealed that this strategy emphasizes a learner-oriented path, the development of their problem-solving ability and the culture of mutual partnership and intensive cooperation in the teacher community. Despite of several merits originating from PTS pedagogy, there remain a few issues to address, including the challenges to teachers in practising this approach, the appropriate means to evaluate students’ learning outcomes and the degree of autonomy granted to the students. Zusammenfassung (Hui-Wen Hsia, Sophia Shi-Huei Ho & Robin Jung-Cheng CHEN: Innovative Pädagogik: Ein Fallbeispiel – das Culinary Arts College in Taiwan): Lebenslanges Lernen wurde von vielen international renommierten Organisationen anerkannt, die behaupten, dass Menschen bestimmte Lebenskompetenzen besitzen sollten, um in einer Welt voller komplexer Unsicherheiten zu leben. In dieser Studie schlagen die Autoren eine phasenweise, thematische und sozialisierte (PTS) Pädagogik als Lehransatz vor, um die Fragen zu behandeln, wie Lernende mit besseren Fähigkeiten ausgestattet werden können. Die qualitative Methode wurde anhand einer Fallstudie angewandt, in der Interviews mit mehreren Interessenvertretern geführt wurden. Ebenfalls wurden eine Beobachtung der PTS-Praxis und die Analyse der Schulunterlagen durchgeführt. Die Ergebnisse zeigten, dass diese Strategie einen lernerorientierten Weg, die Entwicklung der Problemlösungsfähigkeit und die Kultur der gegenseitigen Partnerschaft und intensiven Zusammenarbeit in der Lehrergemeinschaft betont. Trotz mehrerer Verdienste, die aus der PTS-Pädagogik herrühren, gibt es noch einige Fragen zu klären, darunter die Herausforderungen für Lehrer bei der Anwendung dieses Ansatzes, die geeigneten Mittel zur Bewertung der Lernergebnisse von Schülern und der Grad der Autonomie, der den Schülern gewährt wird. Резюме (Хью-Вен ХСИА, София Ши-Хьюи ХО и Робин Юнг-Ченг ЧЕН: Инновационная педагогика: Конкретный пример из практики – Кулинарный колледж в Тайване): Непрерывное образование было признано многими известными на международном уровне организациями, которые утверждали, что люди должны обладать определенными жизненными компетенциями, чтобы жить в мире, полным неуверенностью в завтрашнем дне. В данной работе авторы предлагают пофазную, тематическую и социализированную (ПТС) педагогику в качестве метода для рассмотрения вопросов о том, как учащиеся могут приобрести лучшие способности. Качественный метод был применен на основе исследования на конкретном примере, в котором были проведены интервью с несколькими участниками. Также было проведено наблюдение ПТС.практики и анализ школьных документов. Результаты показали, что данная стратегия подчеркивает ориентированный на ученика путь, развитие способности решать проблемы и культуру взаимного партнерства, и интенсивное сотрудничество в преподавательском сообществе. Несмотря на некоторые заслуги, которые проистекают из ПТС-педагогики, необходимо прояснить еще некоторые вопросы, среди которых задачи для учителей при применении данного метода, приемлемые методы для оценки результатов обучения учащихся и степень автономии, которая предоставляется ученикам. UNESCO, the United Nations Educational, Scientific and Cultural Organization, has stressed that the concept of lifelong learning will be central to future human society, which was constructed on four pillars including learning to know, learning to do, learning to live together and learning to facilitate the adaptation to a rapidly changing society. Further, the report advanced the concept by adding another element, learning to change. The European Union (2006) also advocates that lifelong learning has been the prevailing trend among adults, and proposes a Reference Framework including eight key competences: Communication in the mother tongue; communication in foreign languages; mathematical competence and basic competences in science and technology; digital competence; learning to learn; social and civic competences; a sense of initiative and entrepreneurship; and cultural awareness and expression. In a published report titled Definition and Selection of Competencies (DeSeCo), the Organization for Economic Cooperation and Development (OECD) indicates that three categories (1) using tools interactively (e.g. language, technology); (2) interacting in heterogeneous groups and (3) acting autonomously, which are interrelated and inseparable, are strongly urged for all individuals. Crick and Wilson (2005) state that lifelong learning is an educational form that helps people acquire certain skills or/and competences that are necessary to live in a world full of complex uncertainties. Nevertheless, the competences necessary to adapt to the rapidly changing world are barely attained by way of an orthodox pedagogy; thus, educators should pay more attention to what to learn and how to learn rather than what to teach and how to teach. To be specific, in the 20th century, rationalism and the industrial revolution dominated the development of education when intellectual development and standardized performance were extensively promoted. As a result, the ways how classroom space was created and the pedagogy delivered were largely ossified. However, the current needs in education have undergone a tremendous transformation and the existing approaches to pedagogy are no longer a perfect fit for new and future generations where the interaction and relationships among people are increasingly emphasized. Ferrari, Cachia, and Punie (2009) mention that pedagogy has become one of the most crucial enablers to drive innovation in education because the challenges and problems children face and will face are not like a century ago. Further, it can be found that the key competence, in fact, is broadly defined as the capability to cope with relationships, which comprises of how people interact with not merely other people, the world and the society, but also oneself, especially regarding autonomy, introspection, creativity and own growth. The Finnish National Board of Education (FNBE) adds that the education system, i.e. schools and other educational institutions, should make more investments in harnessing the development of learners’ thinking skills and interaction skills to the social context, as well as of the knowledge of the self and responsibility (The Finnish National Board of Education, 2011). Yet, these competences are barely acquired in an orthodox pedagogy; thus, an innovative pedagogy is needed to inspire educators and teachers to engage in the conception of a new teaching approach to advance students’ future development. In this regard, the lesson’s content and delivery are no longer confined to textbooks, and the role of the teacher is not the controller of knowledge delivery; it is rather that an innovative pedagogy must merge the educational content with issues that matter to learners in their lives, and teachers will act as mentors, sparking meaningful discussion in classrooms by encouraging students to ask open-ended questions with appropriate interventions. Underlying this approach, a new educational culture needs to arise in order for individual attributes to be exploited when major changes occur in future society (Newton & Newton, 2014). To nurture ability, Cachia, Ferrari, Ala-Mutka, and Punie (2010) argue that an educational culture has to be reformed toward a more creative learning and innovative teaching where leadership, accountability, problem solving skills and so forth can be achieved. However, the traditional linear design of teaching material and courses has failed to meet the demands for the future generation to adapt to the rapidly changing and diversified world. Conversely, an education system must be in a position to initiate a new pedagogy associated with life experiences and interpersonal skills to enhance the practice and availability of learning outcomes. School is an initial ground for students to gain their social experience. It has always functioned as a collective manner of living with extensive as well as intensive interaction among teachers and peers, and from an education perspective, creativity should also be embedded in the school system, so that students can acquire interpersonal skills and the ability to think in their interaction and in lessons; yet, the extant form of education cannot take on such a functional role as it is supposed to (Newton & Newton, 2014). As may be expected, the traditional school is not able to form a suitable environment for learners to uncover new ideas, satisfy their curiosity and be open to innovation; instead, these abilities require an integrated form of learning that expedites the attainment of problem-solving skills under real-world conditions. Consequently, this idea prompted Hsia to propose a new pedagogy named PTS by employing an experimental method where he obtained the data from the culinary college he manages. This new educational approach has set its goal of resolving the predicament we are confronting in today’s education system. PTS initiates the course by transmuting the traditional concept of learning into one tailored according to students’ interests. Namely, this pedagogy sets out from the learners’ standpoint to pave the path for the student to develop their learning process and career trajectory. Hence, students have a certain degree of autonomy to decide what they want to learn instead of what they should be taught based on demonstrating their interests and ideas. It is noted that the role of school and teachers is to help students define their own needs so that they can outline a work strategy and further perform a self-evaluation of their efforts. Adams (2005) mentions that traditional classroom learning has lacked a flexible way for students to explore, and academic grades appear to be a means of confining their development instead of increasing their ability. To reverse the drawbacks brought about by conventional pedagogy, the philosophy of PTS is that students are encouraged to seek the kinds of professions and skills that are beneficial to the career they feel interested in. To create such a favourable learning environment, the three pillars supporting PTS pedagogy consist of the competences of interaction, professionalism and execution which are interrelated and equally shared. Sources of conflict can emerge within the individual, between individuals or groups, or be the result of tensions in the organization; a conflict entails effective communication so that a shared understanding can be sought between individuals and groups (Dimbleby & Burton, 1998; Hargie, 2010). However, the way we are taught to address interpersonal conflicts has been centered on counseling rather than being taught how to resolve a discrepancy through effective communicative and interactive skills. Conflicts can occur at all levels of interaction since there exist real differences of interest, and differences of attitudes, beliefs and values. Accordingly, dealing with conflicts is a critical and frequent event in a relationship in an individual’s life and people should learn how to handle any conflict adequately and tactfully, leading to a certain closeness by producing mutual understanding and respect. Nevertheless, given the overemphasis of academics and lack of daily practice in class, a healthy approach to resolving conflicts has been paid the least attention in school. In this regard, interpersonal communication skills must be integrated into the curriculum by means of dividing the children into subgroups which can be leveraged as an opportunity to learn interpersonal skills across different personal and contextual conditions. Therefore, PTS addresses this issue by designing the curricula with several characteristics of problem-based learning. This concept rests on the principle that solving the problem requires the students to collaboratively glean extensive knowledge and information and resolve the issue as a collaborative problem-solving group. This instructional methodology provides students with ample opportunities to communicate and interact, so that the communicative and interpersonal skills can be accordingly fostered (Hung, Jonassen, & Liu, 2007). It is widely acknowledged that having a profession has become an indispensable requirement. However, we maintain that having a profession does not represent the extent you can apply to the academics; instead, it entails the incorporation of knowledge into daily life to foster your valuable life skills to achieve excellence. Therefore, competitiveness cannot be invented by sitting in the classroom but by establishing a favourable environment where you can transfer knowledge from learning materials to their practical applications. This pillar emphasizes that a profession cannot maximize its utility without efficient, timely and consistent production. The principles that innovation and creativity play a crucial role in PTS pedagogy entail a production process that can help pupils demonstrate their innovative capability by adding various initiatives and challenges in relation to different fields of life. However, the question lies in how we can accomplish this mission effectively? In our perspective, several elements are included: the ability to communicate and coordinate, diverse thinking, learning about the self and accountability (Adams, 2005). As demonstrated, PTS encompasses three pillars outlining how phaslised, thematic and socialised pedagogy can equip future generations with key competences. To practice the core values, the PTS curriculum should be organized in an interdisciplinary way. This non-linear design enables students to participate in diverse thematic courses to create a culture of teamwork, by which learners can nurture their social competence. This process also catalyzes the students to provoke self-examination, connecting the dots between experience and life, and the knowledge won is thus constituted within the individual’s perception. Put differently, the teaching is differentiated based on the various levels of a student’s ability, and the teaching material has a thematic orientation with a combination of life experience and practice. This pedagogical concept and course design aim to build up students’ interpersonal social skills as a reaction to and in response to the occurrence of problematic or conflictual daily issues. The next section provides an overview of PTS’s three core concepts. Piaget perceived individual development as a continuous process of keeping acclimatized to the environment, and through that process, one’s ability to assimilate knowledge and problem-solving skills will advance at different stages of development. Taken from cognitive development theory, psychologists have applied this rationale to the concepts of prior knowledge and hierarchical learning, expounding that an individual’s understanding of knowledge can be enhanced by reactivating their previous knowledge. As such, learning activities should be orderly and systematically arranged with courses ranging from beginners, i.e. rudimentary concepts, to the more advanced, i.e. theory. Cachia et al. (2010) also note that a new design or revision of existing curricula to elicit students’ creativity and innovation can be considered as a desirable development of cross-curricular competences for our future generations. The content and scale of PTS pedagogy corresponds to the number of students. As the number increases, so does the activity. For example, the elementary level consists of mini groups or classes where the activities are mostly focused on interactive courses. At school level, the school will involve all the students by organizing events such as a school fair or a graduation ceremony. Finally, at community level the content of courses will include social-service learning and extracurricular activities. PTS rests on the principle that knowledge derives from the integration of theory and application, and suggests that the adoption of project-oriented learning can facilitate that integration since it can help students gain knowledge from the learning process when tackling the real-life problems. In PTS pedagogy, the level of a project is divided into three categories of difficulty. At the beginner stage, the children are encouraged to learn how to carry out the task guided by the teachers whose role is primarily regarded as a skilled mentor and coordinator in the process. The next level requires the students’ capability of developing the project under their teachers’ direction. In this category, teachers will hand over some autonomy as a catalyst for the students to apply their own ideas from prior knowledge to the design of projects along with teachers’ supervision. Differing from the prior levels, the project, in the last and most challenging stage, has to heavily rely on students’ independence with little guidance and supervision from teachers to achieve their objective. This assignment testifies to which extent students can use their knowledge and their various abilities in practical experience. Further, through the process, intensive teamwork will encourage the student to respect different opinions, and the intensive work will also enhance the learners’ individual development. The importance of interpersonal communication skills has been constantly underpinned in PTS pedagogical philosophy. Either in thematic class or project-oriented practice, communication and negotiation are essential aspects in each curriculum. PTS further divides these aspects into three levels regarding the complexity of communication, including in-class, in-school and extracurricular communication. This division aims to foster children’s negotiation skills progressively in a bid to complement their development which has been undervalued in conventional pedagogy. Taking the PTS pedagogical strategy into consideration, the design of the PTS curriculum aims to provide students with connected topics and learning materials in sequence from theory-based to practical project-oriented courses. In the elementary curriculum, theory-based courses are delivered to broaden students’ academic knowledge and as a starting point for the practical experience. However, the students may encounter difficulty in applying the academic knowledge to their practice. To resolve this puzzling question, the second stage is designed to help students identify the gap between theory and practice, not only to address the gap, but also as a catalyst to motivate them for further learning. PTS puts significant value on the process of achieving the project, urging that introspection and reflection are fundamental elements interrelated with learning. Thereby, the focus on self-reflective activity is mainly in the final stage, helping students monitor their understanding and adjust their learning strategies; here they can obtain a sense of fulfilment in the course of examining the obstacles and challenges they are confronted with. Hung, Jonassen, and Liu (2007) note that this reflective process can work as a useful tool to help the students become effective problem solvers, because it entails students exercising higher order thinking skills to identify the problems in the designed setting. Abandoning the traditional grouping by class, PTS maintains that each student’s career trajectory varies due to their interest and personal development. As a result, a student’s favorable tendency toward a discipline or task is the main concern in PTS, since the benefits of learning cannot be fully gained without knowing and selecting what they feel interested in. The importance of a grading system is no longer stressed; instead, students can attend the lessons which are interesting to them and advantageous to their career development. The PTS principle places emphasis on social learning through collaboration. Students are therefore grouped by learning ability, teamwork tendency or communicative skills. Dividing students into subgroups by class, age or even without applying any standards may deter them from interacting with others. Hence, we put the learners into a communication circle where students and teachers can meet with different peers at each grouping. Similarly, teachers also cooperate in teams and deem the teamwork as their task to make pedagogical progress. It is strongly believed that a culture of teamwork can take place through interactive learning in small groups and collaborative working in the teacher community, enabling the students and teachers to learn from each other and to further develop their ability and professional competence. As illustrated in table 1, children are separated into three stages based on the number of students, their learning competence, communicative complexity and curriculum complexity. At each stage, they have corresponding tasks and aims to fulfil. It is worth noting that phaslised learning can vary according to the different governance of school. However, it is generally agreed that the design of this learning process should proceed in an orderly and systematic manner as the complexity of projects increases. The pedagogical concept of PTS argues that the conventional teaching method is outmoded, and thus it is necessary for education systems to formulate innovative thinking by adding interdisciplinary elements involving students’ interests, needs and the issues they will have to address in the future. From the perspective of modernism, knowledge is neither objective nor universal; rather, it is socially constructed by society by the arrangement of a group of people through their values, interests and needs. Inspired by this perspective, the design of an integrated curriculum carries the idea that, with no stringently divided courses, the knowledge which students acquire can be more analogical to practice, and help the learners expedite their personal and professional adjustment to society. Hence, in place of conventional subject-oriented teaching, thematic pedagogy focuses on a particular theme with a mix of disciplines. This approach provides the students with a variety of discussion that can boost students’ analytical and problem-solving abilities. Furthermore, thematic teaching provides a learning environment where students can actively interact with others, and through the process, their interpersonal and communicative skills can be cultivated. The following describes what the components of thematic teaching are and what kinds of advantages can be brought to students and teachers. Given that the traditional education system is limited to the boundaries of an unconnectedly disciplinary perspective (Marinova & McGrath, 2004), thematic teaching applies various disciplines to address one or more issues to help students integrate knowledge and practice at the same time. There is widespread agreement that this teaching approach has a positive effect on students’ learning outcomes (Clarke & Braun, 2013; Lipson, Valencia, Wixson, & Peters, 1993). In spite of there being no defined or fixed instruction, its advantage lies in its coherent context, by integrating basic disciplines that can be adaptive to varying topics, places or participants. In this regard, PTS organizes curricula into three categories: multidisciplinary, interdisciplinary and transdisciplinary. Multidisciplinary, or cross-disciplinary teaching primarily focuses on the explicit connections among single disciplines as observed in figure 1 Nicolescu (2005) mentions that the multidisciplinary teaching method concerns the incorporation of several disciplines, and further notes that in spite of crossing disciplinary boundaries, the teaching content still conforms to a defined framework. This approach can help students acquire knowledge by relating the shared ideas and concepts within a discipline rather than assuming that they are able to grasp the connections among various subjects. Yet, these subjects remain independent from each other and show few signs of an integrated curriculum. Source: Drake, S. M. & Burns, R. C. (2004): Meeting Standards through integrated curriculum. Alexandria, Virginia: Association for Supervision and Curriculum Development. pp. 38. Interdisciplinary teaching approach goes beyond the single and distinct disciplinary contributions; rather, this approach targets multiple dimensions of a lesson within the boundaries of different disciplines (see figure 2). Although the teaching method varies, it is based on the principle that the use of overlapping concepts among different subjects as a theme can provide students with a broader overview of a unit. To some extent, the difference between multidisciplinary and interdisciplinary teaching appears to be indistinct; however, the goal and the approach can be distinguished. Nicolescu (2005) noted that there are three degrees to which interdisciplinarity differs from multidisciplinarity: (a) the degree of application; (b) the epistemological degree; (c) the degree of the generation of new disciplines. In contrast to the disparate features of multidisciplinarity, the interdisciplinarity teaching method remains within a sharp framework. Source: Drake, S. M. & Burns, R. C. (2004): Meeting Standards through integrated curriculum. Alexandria, Virginia: Association for Supervision and Curriculum Development. pp. 39. Transdisciplinary refers to teaching by capturing a constellation of disciplines, in which teachers organize a curriculum surrounding students’ interests or in an authentic context of life experience or society. Marinova and McGrath (2004) mention that transdisciplinary pedagogy has become an emerging field of education that can equip learners with the necessary knowledge and skills to overcome the growing complexity and diversity of society. Although this concept evolved from the previously mentioned models, the transdisciplinary approach breaks down the boundary of each discipline by encompassing and integrating the concepts and ideas existing or implied within the circle as exhibited in figure 3 (Nicolescu, 2005; Petrie, 1992; Visser, 1999). This model blends the concepts and ideas of all disciplines into a theme where the boundary between subjects is not distinguished. In this approach, students are encouraged to apply the integration of knowledge and practice to exploring and explaining the issues in their studies so that a set of thinking skills can be largely developed. Source: Drake, S. M. & Burns, R. C. (2004): Meeting Standards through integrated curriculum. Alexandria, Virginia: Association for Supervision and Curriculum Development. pp. 40. Echoing with PTS pedagogy, the interdisciplinary and transdisciplinary teaching strategies are powerful tools to enhance students’ social skills by eliminating the isolated and fragmented structure of a traditional curriculum. The goal of adopting the two approaches is to provide a channel for students to come to a more comprehensive understanding of the world through the integration of knowledge among disciplines. They can relate this competence to occurrences in a rapidly changing world (Morin, 1999). Based on this philosophy, PTS exploits this advantage to launch project-oriented initiatives among which students can choose with respect to their interests. Through this integrated curriculum, the learning material provides a way to help students draw on connections to the real world and life experience. Learning from life experience has been identified as a stimulus to help learners grow socially and culturally, and thus the recognition of learner’s values and understanding can be activated (Andresen, Boud, & Cohen,2000; Hmelo-Silver, 2004). Thematic teaching is designed around topics associated with life experience, and in the curriculum the content integrates academic knowledge and practical experience across disciplines, so that the multifaceted perspectives offered by various concepts can support the development of students’ social and problem-solving skills. It has been widely claimed that building a professional community can make influential contributions to enhancing teachers’ development and improve teaching practices (Grossman, Wineburg & Woolworth, 2001; Little, 2003; Stokes, 2001). The community can construct a culture that engages teachers in brainstorming new approaches to teaching to respond to student needs, thereby also supporting mutual professional growth. Considering the complexity of thematic teaching that requires a lot of hard, initial design work, plus a substantial restructuring of teacher relationships and class schedules, the construction of a professional community can help to improve teachers’ professional development through the values of partnership linked to PTS pedagogical concepts. The teacher’s role in PTS pedagogy is defined as that of a skilled mentor and coordinator; thematic learning can promote learner autonomy and interaction between peers and teachers. Van den Bossche, Gijselaers, Segers, & Kirschner (2006) argue that the source of knowledge construction can be effectively sought if the importance and practice can be strengthened through learning activities that contain diverse perspectives and individual values. Through intensive and continuing interaction and discussion, PTS implements group work and assigned projects to help students perform the tasks by learning from another, and a mutual shared perception of recognizing and solving a problem can be realized. In such an environment, it can be expected that the task performance can be largely increased by collaboration, and this benefit can in return help the development of students’ social skills and individual capacities in the process of shaping and sustaining a shared understanding of an issue or task. Socialization prepares individuals to perform certain social roles in a social group by learning its norms and expectations by means of shared meaning and values. PTS establishes its pedagogy in the manner of a “micro-society”, where students are given autonomy and independence to actively participate in the exploration of their own interests by communicating and interacting in the designed curriculum and learning space. In addition, the culture of communication and interaction between peers and teachers is also promoted in a bid to engage the students and teachers in a social context to develop their interpersonal skills. It is worth noting that this independence is not informed by merely providing the students with the knowledge of how to interact with people, but directly having them learn in the field of “society” itself, so that they gain an explicit awareness of their own needs, as well as an understanding of methods of self-enhancement. This practice helps learners pursue social activities and at the same time, better control and direct the development of their abilities (Adams, 2005). In other words, PTS attempts to create the learning environment that can function as a society by adopting a range of teaching approaches including cooperative learning, situative learning, mixed-age learning groups to foster not just a climate of teamwork and coordination among students, but with the ultimate goal of nurturing students’ interpersonal ability to bridge the gap between school and the real world. PTS has advocated creating an innovative learning environment where students not only take responsibility for their learning process, but also for the path to their career. Therefore, students in PTS are immersed in a respectful and equal interaction in this “quasi-society”, where they can demonstrate their independence by seeking the learning interest of their own choice. They do not only make their own decisions, but also take responsibility for the results of their actions. Another point in social learning is that students are taught that the differences between individuals and groups should be addressed in respectful and constructive ways so that the concepts of individual independence and the equality can thus be strengthened. Centering on the students’ needs, PTS pedagogy rests on the principle that students can autonomously undertake projects and are supported in learning independently by themselves, or in groups, to cultivate their problem-solving ability. It is widely acknowledged that problem-solving programmes are conducive to developing a broad range of thinking abilities that can engage students in relevant, ill-defined, real-life experience (Adams, 2005). Accordingly, curriculum design tends to focus on the idea of autonomy in learning, respecting one another’s ideas and intensive work involving thinking skills training. Through a task-based approach, PTS can help learners discern the needs and abilities in which they are interested and further motivate the students to pursue their goals. PTS is convinced that a teacher-centered way of teaching can no longer provide the students with the abilities relevant to our current and future society; instead, individual development should be achieved by the integration of topics relevant to everyday life and the use of thematic areas as well as the freedom of learning granted to the students. Within the framework of PTS innovative pedagogy, teachers are not decision-makers but rather mentors, supporting students’ activities in their connection to social life and encouraging an intensive and healthy dialogue of sharing ideas and perspectives among students to fulfil self-efficacy. PTS strategy abandons the conventional teaching method – the transmission and reception of knowledge; instead, the teaching strategy encompasses the learning environment where the interaction between teacher and students who are actively and reflectively engaged in knowledge-making is conducive to the intellectual and social development for both. Also, intensive cooperation in the teacher community is reinforced in the teaching strategy. The colleagues regard themselves as a ‘real team’ and work collaboratively on the teaching materials. A culture of learning and working together advances teaching progress and the intensive and sustained cooperation also enables them to learn from each other and to further develop their work. PTS tends to organize a structure of professional cooperation to help teachers complement their work with a large number of necessary cooperative arrangements to create a strong sense of community. The aspects of communication and interaction skills PTS pedagogy has underpinned can cultivate students’ adaptive abilities to work with people and their environment, as well as further facilitate the students in future employment and social activities. Likewise, innovative initiatives can prepare students to thrive in a rapidly changing world, navigate cultural and socio-economic differences, examine and embrace change, and, above all, engage and collaborate with an ever-widening variety of people. Accordingly, to reflect the philosophy and aims of PTS pedagogy, it is stressed that personal development cannot be attained without parental participation and teachers’ support. The act of sharing, respecting and cooperating is an underlying element in both the learning process and the curriculum. Like the above-mentioned, the design of learning content is derived from a life-world perspective and practical experience and from the cultural sources considered in our society as important for the development of people and society. Active learning refers to students who move from a passive pattern of receiving knowledge to actively participating in the learning activities and engaging themselves in discovering values and building learning attitudes (Bonwell & Eison, 1991; Sivan, A., Leung, Woon, & Kember, 2000). To increase students’ independence, in lieu of subject-oriented lessons, the PTS task-based curriculum equips the students with enough flexibility and autonomy to help them understand themselves as active and independent learners. Sivan et al., (2000) argued that becoming active in acquiring skills and knowledge not only makes useful contributions to developing students’ independent learning skills and the ability to apply knowledge, but is also conducive to seeking their interests in learning disciplines and further helping them discover their students’ career development. Accordingly, in this approach, students are encouraged to learn from their mistakes and experience the fruit of their efforts by deepening their understanding of transdisciplinary teaching on the basis of their individual abilities and interests. It is noted that the support and assistance provided by teachers occur only when students are not able to determine their own learning process. 4.2.1 Do teachers have the ability to carry out phaslised teaching? The design of the phaslised teaching approach is not common and challenging for teachers themselves instructed in a traditional manner. This innovative approach not only entails teachers’ professionalism and a new way of thinking about teaching, but also requires teachers to value teamwork, as they are in an environment of learning and intensive cooperation to produce pedagogical progress together. Moreover, not only do the standards of subdividing students into different segments challenge the teachers, but also developing and making adaptive learning materials requires teachers with higher professional competence in order to support students’ various skills and levels of competence. 4.2.2 How can the learning outcome be evaluated? Given that thematic learning involves a combination of different disciplines, the traditional standardized test does not appear to be an appropriate tool to assess students’ learning outcomes. Consequently, alternative ways of assessment should be invented with regard to evaluating students’ abilities and personal characteristics. After all, each individual in PTS pedagogy is deemed to be a unique personality, and there is no doubt that formulating a diverse evaluation mechanism would be an arduous task. 4.2.3 How much student autonomy can PTS allow? Despite autonomy being the essential element for this pedagogy, there exists an ambivalent boundary regarding how much freedom the school and teachers can give to the students. In other words, the degree of autonomy should be carefully defined so that students know how far they can go. Therefore, the balance of autonomy and regulation remains the emerging issue in this pedagogy. Adams, K. (2005): The sources of innovation and creativity. In: A paper commissioned by the National Center on Education and the Economy for the New Commission on the Skills of the American Workforce. Washington: National Center on Education and the Economy. Andresen, L., Boud, D. & Cohen, R. (2000): Experience-based learning. In: Understanding adult education and training, 2, pp. 225-239. Cachia, R.; Ferrari, A.; Ala-Mutka, K. & Punie, Y. (2010): Creative learning and innovative teaching: Final report on the study on creativity and innovation in education in EU member states (No. JRC62370). Institute for Prospective and Technological Studies, Joint Research Centre. Crick, R. D. & Wilson, K. (2005): Being a learner: A virtue for the 21st century. In: British Journal of Educational Studies, 53 (3), pp. 359-374. Delors, J. (1996): Learning: The treasure within. Report to UNESCO of the International Commission on Education for the Twenty-first Century. Paris: UNESCO. Dimbleby, R. & Burton, G. (1998): More than words: An introduction to communication. New York: Routledge. Drake, S. M. & Burns, R. C. (2004): Meeting standards through integrated curricula. Alexandria, VA: Association for Supervision and Curriculum Development. Grossman, P., Wineburg, S. & Woolworth, S. (2001): Toward a theory of teacher community. Teacher College Record, 103 (6), pp. 942-1012. Hargie, O. (2010): Skilled interpersonal communication: Research, theory and practice. 5th edition. London: Routledge. Hmelo-Silver, C. E. (2004): Problem-based learning: What and how do students learn? In: Educational psychology review, 16 (3), pp. 235-266. Lipson, M. Y.; Valencia, S. W.; Wixson, K. K. & Peters, C. W. (1993): Integration and thematic teaching: Integration to improve teaching and learning. In: Language Arts, 70 (4), pp. 252-263. Little, J. W. (2003): Inside teacher community: Representations of classroom practice. Teachers college record, 105 (6), pp. 913-945. Lovat, T. & Clement, N. (2008): Quality teaching and values education: Coalescing for effective learning. In: Journal of Moral Education, 37 (1), pp. 1-16. Newton, L. D. & Newton, D. P. (2014): Creativity in 21st-century education. In: Prospects, 44 (4), pp. 575-589. Nicolescu, B. (2005): Towards transdisciplinary education. In: The Journal for Transdisciplinary Research in Southern Africa, 1 (1), pp. 5-15. Petrie, H. G. (1992): Interdisciplinary education: Are we faced with insurmountable opportunities? In: Review of research in education, 18 (1), pp. 299-333. Sivan, A.; Leung, R. W.; Woon, C. C. & Kember, D. (2000): An implementation of active learning and its effect on the quality of student learning. In: Innovations in Education and Teaching International, 37 (4), pp. 381-389. Stokes, L. (2001): Lessons from an inquiring school: Forms of inquiry and conditions for teacher learning. In: Lieberman, A. & Miller, L. (Eds. ): Teachers caught in the action: Professional development that matters, pp. 141-158. New York: Teachers College Press. Van den Bossche, P.; Gijselaers, W. H., Segers, M. & Kirschner, P. A. (2006): Social and cognitive factors driving teamwork in collaborative learning environments: Team learning beliefs and behaviors. In: Small group research, 37 (5), pp. 490-521. Visser, J. (1999): Overcoming the underdevelopment of learning: A transdisciplinary view. Paper presented at the Annual Meeting of the American Education Research Association, held Montreal, Canada, 19-23 April 1999. URL: http://www.unesco.org/education/educprog/lwf/dl/visser_f.pdf (retrieved: June 15, 2017). 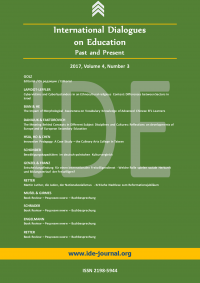 Wallace, J.; Sheffield, R.; Rénnie, L. & Venville, G. (2007): Looking back, looking forward: Re-searching the conditions for curriculum integration in the middle years of schooling. In: The Australian Educational Researcher, 34 (2), pp. 29-49.